Ensuring the security of the sensitive data stored on your Microsoft SharePoint Server requires far more than a set-it-and-forget-it approach to assigning view, create and modify access rights. You need continuous SharePoint permissions auditing that enables you to regularly verify that everyone has the right level of access to critical data and ensure nothing is overexposed. This effective SharePoint permissions reporting is critical, since any deliberate or accidental permission changes could lead to privilege abuse that results in the loss of sensitive data. Permissions management is often left to the various department heads, who all too often assign unique permissions directly to users, in violation of best practices. Moreover, each user can be a member of a group nested inside of one or more other SharePoint groups that have different sets of permissions to the same resources. 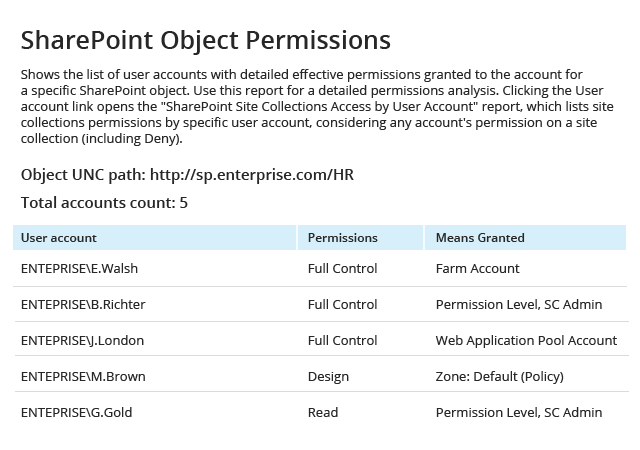 Since native reports provide only a list of users assigned permissions to site collections, list items and other SharePoint objects, it can be very hard to see a specific user’s effective permissions to sensitive data each time you want to verify that only authorized employees have access to critical SharePoint data. Using built-in SharePoint permissions reporting tools, administrators can configure site collection audit settings. Then they can build a report on SharePoint permissions and export it to a CSV file using Windows PowerShell or ECP. However, the native SharePoint user permissions report won’t provide a list of user effective permissions. Plus, native logs don’t offer easy-to-read details about critical permission changes. For instance, if someone was granted permissions to sensitive data, you’ll have to spend a great deal of time struggling to determine who updated those privileges, what the permissions were before the change and whether they comply with your security policy so you can respond appropriately. Netwrix Auditor for SharePoint is a SharePoint permission reporting tool that empowers you to quickly find out how exactly permissions were granted and identify broken inheritance. With the security intelligence it provides, you can ensure that everyone has the right level of permissions and that business-critical data is not overexposed, so you can prevent data leaks and compliance violations. 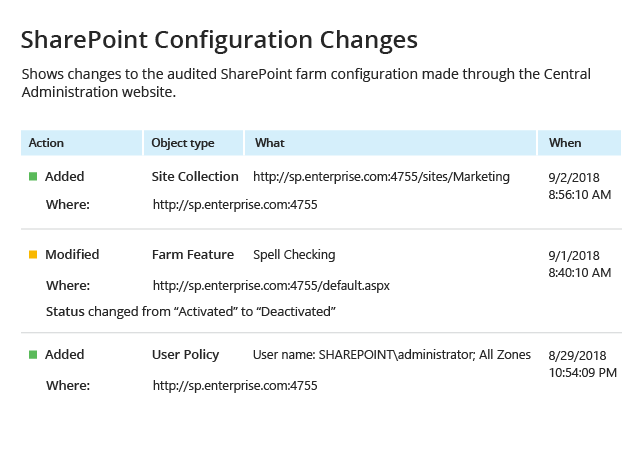 Netwrix Auditor for SharePoint also provides SharePoint user permission reports that help you keep track of document reads and changes to permissions, farm configuration, groups and content. Too often, these critical events go unnoticed until the organization discovers a breach, fails a compliance audit or experiences downtime. Unlike native audit log reports, Netwrix Auditor’s easy-to-understand reports and overview dashboards give you valuable information about every change across your SharePoint platform — who made each change, when and where it was made, and exactly what was changed, with the before and after values — so you can detect suspicious activity, respond in a timely manner and improve permission management.